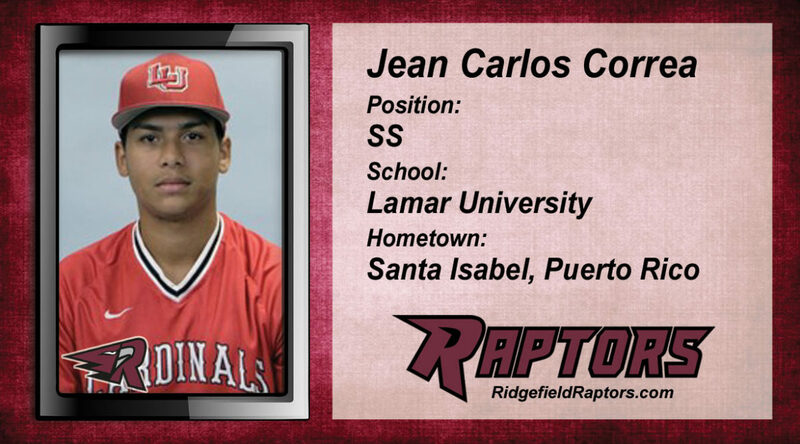 The Ridgefield Raptors are excited to announce the addition of Lamar University’s Jean Carlos “JC” Correa to the 2019 Roster. Jean Carlos is the brother of Houston Astros shortstop Carlos Correa and brings a sophisticated approach to his game. The move to Lamar University has kept him close to his 24-year-old big brother and gets him to Division I. Originally from Santa Isabel, Puerto Rico, Correa spent his high school years playing for the Puerto Rico Baseball Academy, as his brother did before him. A middle infielder like his brother, Jean Carlos chose to play college baseball in the United States to help develop his skill set rather than try to go pro at an early age. While his education is important, the anticipation is that Jean Carlos could be drafted during the 2019 MLB draft. He and his family will give it strong consideration for his next career steps. Please welcome JC to Ridgefield and Southwest Washington!